Junior Elana Feliciano fills out a scholarship paper. A group of students munch on cheese pizza as the coordinator informs students on numerous ways to earn easy effortless scholarships. Every Thursday in the lecture hall, a group of students sponsored by the YMCA meet up to discuss ways to prepare for their future. 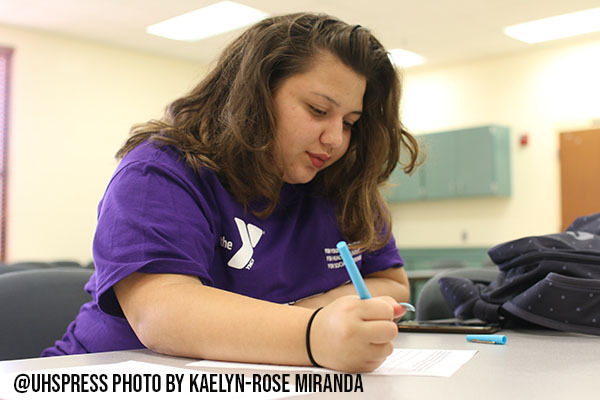 “Project 396 is a club that makes you feel like you’re at home because you can say anything you want, and nobody is going to judge you,” senior Keilyn Martinez said. Members within in the club feel that it is a chance to be around others similar to themselves to share new experiences. Outside of school is where project 396 gets the opportunity participate in activities with students from other schools as well. Project 396 is a grant-funded program, so students can go on trips and do activities without paying any fees. Students in the club feel it serves a positive outcome in serving as a learning environment as well.